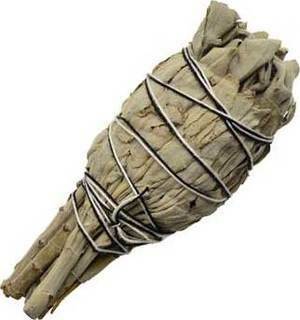 Shop > Ritual Supplies > Smudge Sticks > California White Sage Smudge Stick 4"
Hailing form the coastal mountains of California and corresponding with the same magical aspects of all herbal sage, this White Sage smudging wand or stick is lit at one end and used to cleanse people, spaces, and other objects. Pre-wrapped and ready for use this sacred item can be used on it's own or in conjunction with other herbs and incenses in ritual. Once burnt past the last wrap place loose sage in a fire safe container, such as a abalone shell, and continue to allow the sage to smolder. This is a single California White Sage smudging stick or wand approximately 4 inches in length.